this year? This high season a limited number of luxury suites are still available. 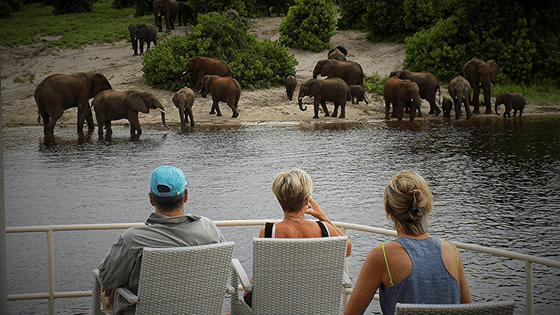 Dreaming of a Chobe River safari but missed the boat when it came to bookings this year? This high season a limited number of luxury suites are still available. Don’t miss this rare opportunity to set sail with the elegant Zambezi Queen in 2018. With golden sunsets, lush surrounds and a mesmerising African ambience, it’s no wonder Harry and Meghan fell head over heels during their stay in beautiful Botswana. 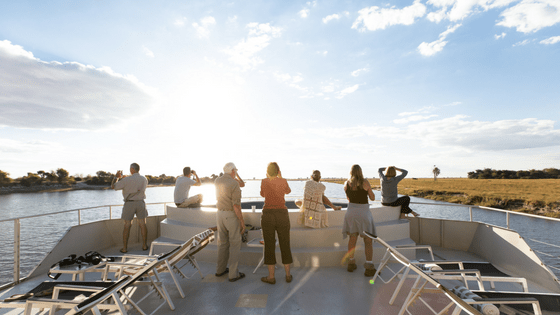 It’s also no surprise that a river cruise on the sought-after Zambezi Queen, which sails along the borders of Namibia and the Chobe National Park in Botswana, is fully booked years in advance. However, this high season in July and August, a limited number of luxury suites are still available – a rare sighting indeed! Book now or read on to discover what you’ll be missing if you don’t. Gliding along 25km of the majestic Chobe River, the five-star Zambezi Queen is truly a sight to behold. Featuring 14 exquisite suites furnished with their own private balconies, this elegant floating hotel gives guests a front-row seat to arguably one of the most spectacular natural settings in the world. Gaze out over serene floodplains, lush forests and open woodlands where a myriad wildlife perch, swim, hunt, drink and laze on the river banks right before your very eyes. 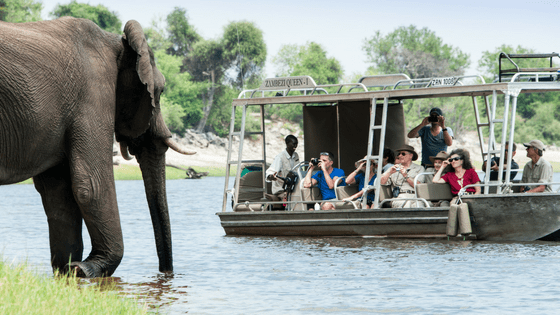 The Chobe National Park is famous for having one of the densest populations of elephant on the African continent with as many as 120 000 living in the area. You won’t have to look far for incredible sightings of other beautiful wildlife too, including numerous buffalo, leopard, lion and antelope. Bird life is also abundant, with sightings of over 450 species on offer. These include African skimmers, fish eagles, open-billed storks, pied kingfishers and the beautiful carmine bee-eater to name just a few. In addition to the utmost in luxury and leisure, the Zambezi Queen offers its fair share of adventure too. Fishing enthusiasts can try their hand at catching the legendary ferocious Tigerfish in the churning river waters. Tender boats venture out into the narrower waterways for a truly up-close view of wildlife in their natural habitat. Bird watching safaris provide ample opportunities to see a multitude of species take wing, perch or wade in the blissful surrounds. While fascinating cultural tours to the local village offer insights into the locals, their history and traditions. Land-based adventures include a walk to the 2000-year-old baobab tree, learning local herb lore and mythology along the way. For a truly unsurpassed view, climb up the tallest tree and see where the mighty Zambezi and Chobe Rivers meet on the borders of Zambia, Namibia, Botswana and Zimbabwe. With everything from fine dining and luxurious accommodation to leisure activities and exciting excursions taken care of, all that’s left for you to do is relax and enjoy the view. 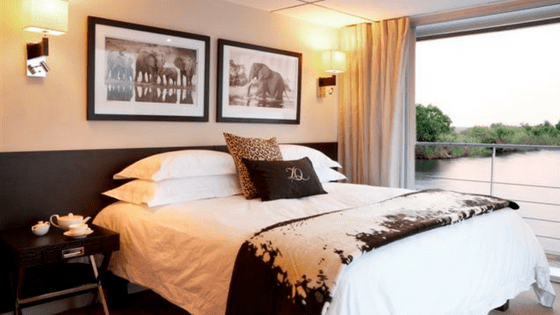 Only a limited number of suites are still available which you can view here, so book soon to secure your unforgettable Chobe River safari today!